Jonathan (All the Boys Love Mandy Lane) Levine’s Warm Bodies is based on a Young Adult novel. Who the hell cares? If you write this flick off as tweeny bopper Twilight fare, you will be missing out on one hell of a movie. This is not a send up. This is not some watered-down zombie version of The Notebook. Whatever misconception you probably have, this is not it. Bodies, like Shaun of the Dead, is a Zom-Rom-Com with a very beating heart. 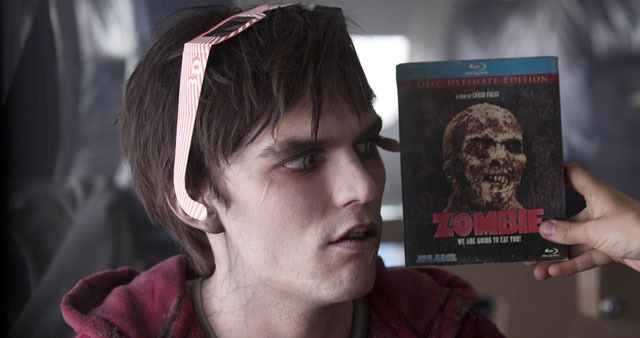 Nicholas (About a Boy) Hoult stars as R, a Corpse that wants to do more than just mill around an old airport, eating brains. R’s narration is a key source for the comedy as well. Without being a parody, he touches on all the normal traits of a zombie film. He has no idea what happened, what caused this apocalypse or why he is what he is. He shares meaningful grunts and awkward stares with his “best friend” zombie Rob (Hot Tub Time Machine) Cordry. He explains why they roam around in packs (everyone and their grandmother is always trying to shoot them in the head) and he is fully aware of how ridiculously long it’s going to take their horde to get anywhere, rambling as slow as they do. The humans, Theresa (Take Me Home Tonight) Palmer, Dave (James’ brother) Franco, Analeigh (America’s Next Top Model) Tipton and John (duh, he’s John Malkovich) Malkovich, are all excellent in their roles as well, living behind their Escape from New York style wall, venturing out only for supplies. It’s on one of these supply runs that R encounters Julie (Palmer). Get it. R. Julie. Romeo and Juliet. Cliché maybe, but don’t worry about that. It’s not very heavy handed, and takes nothing away, in my opinion. R is instantly under Julie’s humanly thrall, so he saves her. And takes her back to the airplane in which he ‘lives’. They listen to records. Good time for a sidebar: The soundtrack is stellar. It’s a good mix of current stuff (Feist), 80s tunes (John Waite) and jams that fit their scenes perfectly (Bruce Springsteen). Since there is no officially released CD/MP3 version of the soundtrack, check out this site for a complete listing, and make your own soundtrack. It’s interesting to me that the dead guy is obsessed with a dead format. A dead format that, as of recently, is coming back to life. The living girls listen to music on their iPods.Hoult is excellent. Aside from the narration, he has to express himself primarily with facial expressions and movement. And grunts and eventual monosyllabic speech. The entire cast, which is really only six, does a great job with their respective characters.It’s hard to refrain from gushing, because it really has been a long time since I’ve seen a zombie film—or a romantic comedy—that I enjoyed as much as Warm Bodies. Every negative post I see online or every Facebook status update that derides this movie, assuming it’s just for the Team Edward crowd, bums me out. It’s clear Levine (and I assume novelist Isaac Marion?) really knows his undead. And loves the rotting bastards. That love is infectious. And really, infectious love is the point of this movie.